If You're Travelling in The Northeast, Mawlynnong Should Definitely be on Your Itinerary. 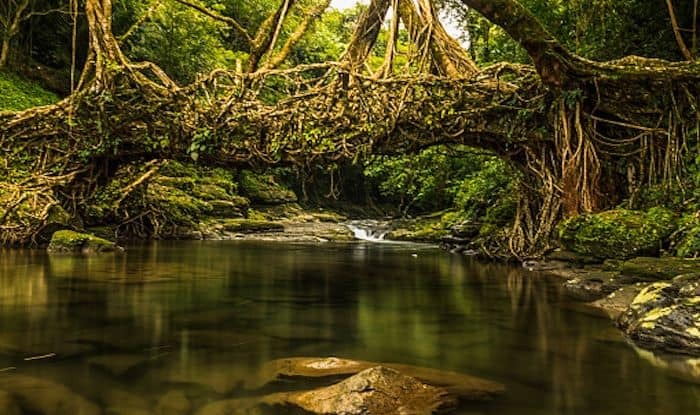 Mawlynnong, a quaint village in Meghalaya, is located 90km from the capital Shillong and 92km from Cherrapunji. It’s a must visit when you’re in Meghalaya; apart from the glorious natural beauty that this place abounds in, the fact that it has won several accolades for being the cleanest village in Asia in the past makes it paradise on Earth. It’s beautiful to see how the residents of this tiny village make a collective effort of keeping the village neat and clean. The village has a toilet in every house, and the children here are taught at school to keep their surroundings clean. Start your trip here by visiting the famous Living Root Bridge at Riwai. It is indeed a natural wonder; it is formed by growing the roots of trees for decades. It’s a bit of a trek to get there: you will have to cross approximately 100 steep steps to get to the bridge but well worth it. Mawlynnong Waterfall is another gorgeous attraction in this village. The water gushes out from a certain height and this beautiful view truly soothes the mind and the soul. This ambiance around here is magical, and makes for a perfect place to unwind or have a picnic with your loved ones. A major landmark of Mawlynnong is the Church of Epiphany – a 100-year-old structure that has an unmissable old-world charm. The churches made of stones and the premises have a lot of greenery and patches of red and orange flowers that makes it look straight out of a postcard. Another thing you must experience here is a bird’s eye view of India and Bangladesh from Sky View. It is a vantage point with a viewing tower about 85 feet high and made of bamboo. Once you reach the top, you’ll be overwhelmed with the breath-taking views; since the village lies on the Indo-Bangladesh border, it’ll be a surreal experience to see much of the landscape of Bangladesh as well. Shopping is Mawlynnong is quite an exciting experience. You can buy everything from Tibetan artefacts, honey, bamboo pickle, to local handicraft such as various types of nets and bags. Among the best markets are the Shella Bazaar, Police Bazaar, Bara Bazaar, and Laxmi Bazaar. The best time to visit here is especially during the monsoons, when the beauty of the village quadruples with lush greenery all around. The waterfalls gush noisily, there are small meandering streams everywhere, and orchids blossom and hang from the trees and hedges adding to the overall beauty of the village. The nearest airport is Shillong Airport (78km away) which has flights from all the major cities of the country.